There is good news if you are a small business looking to take on an apprentice this Spring. 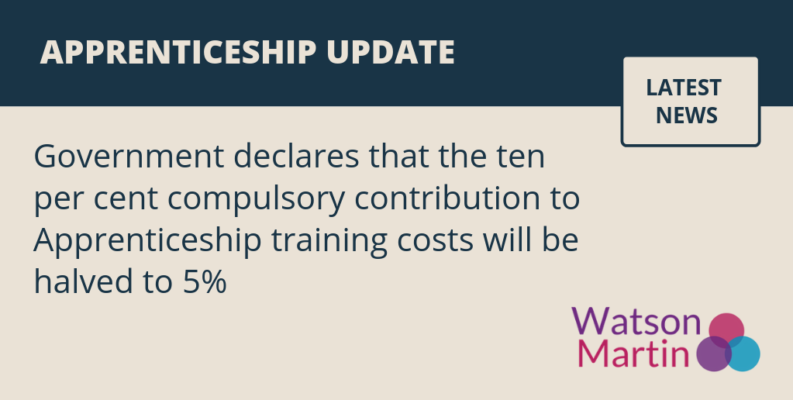 From 1 April, the Government has declared that the ten per cent compulsory contribution to Apprenticeship training costs will be halved to five per cent. The change was announced by the Chancellor Philip Hammond during his Spring statement earlier this month and will affect SMEs with more than 50 employees and annual salary bills of less than £3 million. Smaller businesses with fewer than 50 staff will continue to have 100% of the Apprenticeship costs covered. At the same time, the Chancellor announced that levy-paying employers – those with a salary bill of over £3 million – will be able to share more levy funds with other organisations, including smaller businesses in their supply chain, with the maximum amount rising from ten per cent to 25 per cent. The move, which is part of an overall drive by the Government to increase the number of apprentices, has been welcomed by Watson Martin’s Apprenticeship expert Sharon White. “Small businesses have been waiting for this announcement since it was first raised in the Chancellor’s Budget speech last October and it’s possible that some employers have been reluctant to take on an apprentice until the change is made. Whilst the business case for taking on an apprentice is extremely strong, SMEs still need to factor in the associated training costs and the five percent reduction will make a major difference as they plan their future Apprenticeship strategy,” she explained. “We also welcome the news that levy-paying employers will be able to share up to 25 per cent of their levy funds to any non-levy employer and Apprenticeship training agencies. Apprenticeships provide a great opportunity to not only attract new talent but to train existing teams. Now is the time for companies that haven’t made use of the levy to take the plunge and get on board,” Sharon added. Approved as a main RoATP provider in January 2018, Watson Martin works both with companies which pay into the levy and in collaboration with other training providers to deliver HR Levels 3 and 5 Apprenticeship programmes nationally.